France doesn't have trees big enough to provide wood beams of the size of those used for the roof centuries ago. • The relic said to be the Crown of Thorns, or Crown of Christ, was saved. That and other pieces were quickly taken to a “secret location” after the fire, Paris Deputy Mayor Emmanuel Grégoire said. Catholics believe the crown was pressed onto Jesus’ head during the crucifixion. King Louis IX brought it to Paris in the 13th century. "The works of art, the most precious treasures, were secured last night," French Culture Minister Franck Riester said. • France doesn't have trees big enough anymore to provide wood beams the same size as the oak ones used for the roof centuries ago. French cultural heritage expert Bertrand de Feydeau told France Info radio that "we don't, at the moment, have trees on our territory of the size that were cut in the 13th century." An expert on medieval art and architecture told The Associated Press there probably aren’t big enough trees anywhere in Europe today. • France itself, not the Catholic Church, owns the cathedral. President Emmanuel Macron said he wants to rebuild it within five years. "We will rebuild Notre Dame Cathedral even more beautifully," he said. 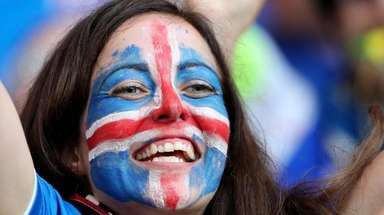 The state separated from the church in 1905, Oxford University Prof. Diarmaid MacCulloch told "BBC Newshour," and "the state took over the greatest buildings in Paris, which were the churches. And they're therefore owned by the state. And the church has a slightly anomalous place within its own buildings, and that’s been part of the problem," said MacCulloch, whose work is on the history of Christianity. 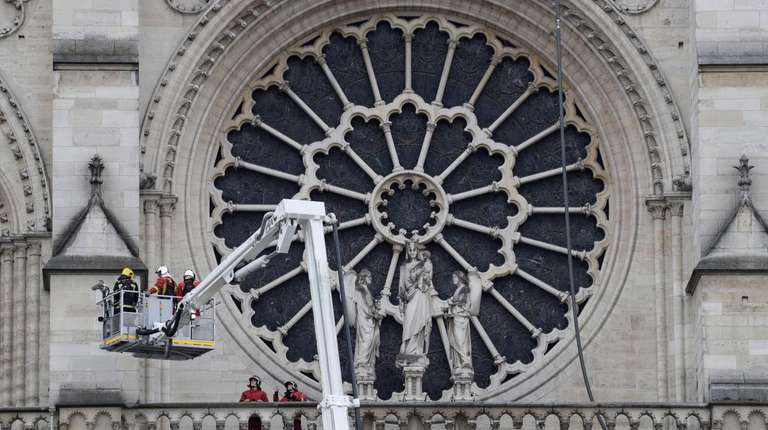 "The brute fact is that Notre Dame has not been in a good state, and that's one of the reasons there was a great restoration program already." 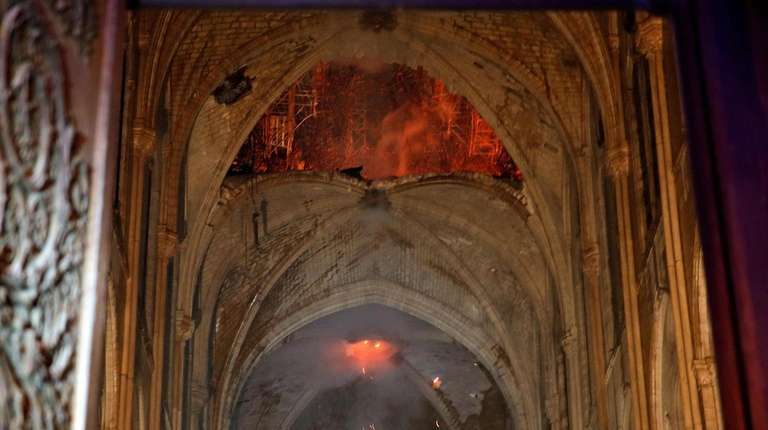 • Notre Dame's two towers on the front of the cathedral, which withstood the fire, were finished around 1245 — while the spire that collapsed in flames Monday was built only in the 19th century. • The cathedral has seen and survived much in its eight and a half centuries — including when revolutionaries took it over and made it a "Temple of Reason." It "suffered terribly in the French Revolution," MacCulloch said. Edward B. Colby, a Senior Internet News Manager, leads Newsday.com's Nation/World section. He covered the 2016 national conventions and President Trump's inauguration. 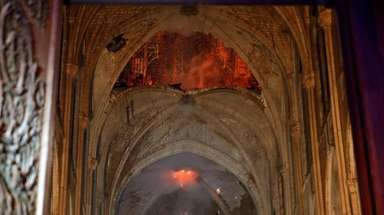 Notre Dame fire: What was lost, what was saved?Some treasures were lost to humanity forever in the blaze that ravaged the Paris cathedral. Others were spared, at least in part, or saved before the flames consumed the roof and spire. Macron wants Notre Dame rebuilt within 5 yearsThe inferno that raged through Notre Dame Cathedral for more than 12 hours destroyed its spire and its roof but spared its twin medieval bell towers, and a frantic rescue effort saved the monument's "most precious treasures," including the relic revered as Jesus' Crown of Thorns, officials said. 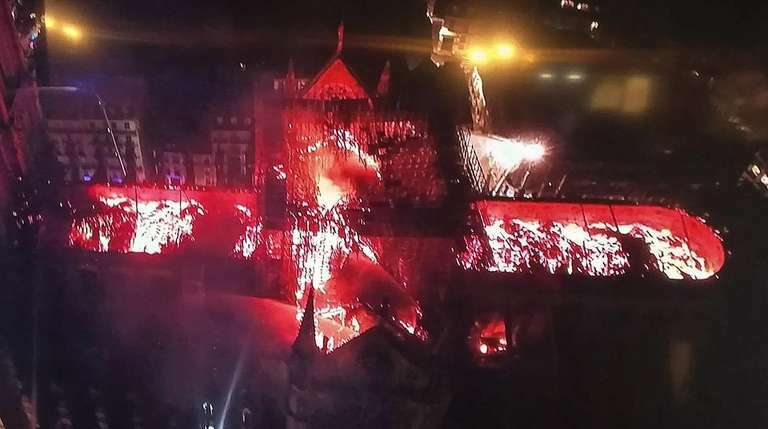 Notre Dame fire even more heartbreaking due to timingFor many in this largely Catholic country, especially for the most faithful, the medieval masterpiece is a sacred space that serves as the spiritual as well as the cultural heart of France.